On this day in history, 1948, the Sultan of Swat died due to naso-pharyngeal cancer (often mistakenly said to have been throat cancer). While his historic years as a baseball player are well chronicled, less talked about are the Babe’s final years. 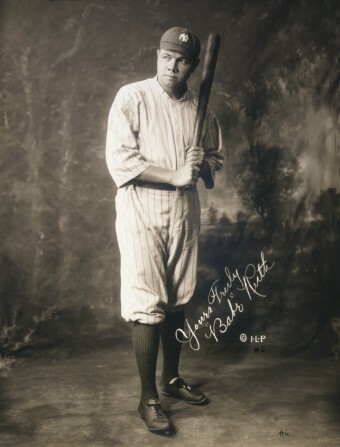 George Herman “Babe” Ruth was one of the most popular and beloved baseball players of all-time. Ruth played 22 years in the major leagues, hitting 714 home runs, accumulating a mind boggling 177 WAR, winning 7 World Series, and becoming baseball’s greatest legend. But now it was 1936, the Babe was 41 years old, and was a retired man. He wasn’t dead, but he was an inhabitant of that strange twilight for athletes – the twilight for men who had accomplished all they can early in life and will accomplish no more at what they were best at. The Babe’s final years, although dotted with happy moments, were mainly a pretty lonely period of a man just killing time. Ruth wanted desperately to become a manager. Unfortunately, no one was interested outside of an offer for a minor-league job managing a Yankee farm team in Newark. But he flatly turned it down, “I’m a Big Leaguer!” According to wife, Claire, the Babe never stopped hoping for the phone to ring and for the call to be that “managing offer” he wanted so badly. Ruth, a wealthy man with no financial worries, spent the final 13 years of his life basically just trying to find ways to fill in the hours, with no goal or purpose to speak of. And so, Ruth “fished”. His daughter Dorothy fondly remembers her dad going off for 3 or 4 days on “fishing expeditions”, ending up with no catches (though in truth, perhaps at times catching a lady or two), and stopping at some market on the way home, buying a batch of fish, then coming home and slapping his “catch” on their kitchen counter, as if he were an ace fisherman. He also golfed, “I played 365 rounds of golf last year. Thank god for whoever invented golf. I’d be dead without it.” Basically, he spent quite a lot of time enjoying various popular sports that those in their upper years can play quite well. In his later years, he still liked his booze, drinking his beloved highballs and consuming other alcoholic treats, and he still followed baseball and had a lifetime free pass to ballgames. Anyone living on planet earth, even in the most secure of circumstances, will be faced with some sadness and emergencies, and Ruth was no exception. Claire’s brother, Eugene, who had been gassed in World War I and was never healthy afterward, jumped from Ruth’s 15th story window to his death one day, after battling with severe depression. Ruth, on vacation from his vacation known as retirement, in Florida no less, rushed home and took care of all the funeral arrangements. In 1938, his daughter, Julia, was in medical trouble with strep throat, and the Babe rushed to the hospital and did his fatherly duties, donating blood to help. Also in 1938, Ruth was hired for his last official baseball job, as a coach for the Brooklyn Dodgers. The Babe was mostly looked on as a “gate attraction” and a “curiosity”. He still harbored a hope to be hired as the manager of the team, but after the season ended it went to Leo Durocher (who Ruth hated) instead. Ruth left the Dodgers bitterly disappointed. In 1942, Ruth appeared, playing himself, in the classic film Pride of the Yankees, a wonderful movie about his old teammate, Lou Gehrig. (Ruth is actually quite good in the film, giving a fine, likable performance). Probably extremely bored and frustrated, Ruth swallowed his pride and asked Yankee management about the long ago offer to manage the Minor League Newark Club. But no, it was too late and the offer was no longer available. Soon after the end of WWII, Ruth started getting very severe headaches and pains in his neck. He went into the hospital for “observation”. According to daughter Dorothy, the headaches were so severe that “he threatened to kill himself.” Sadly, Ruth was never to be out of pain for the final 21 months of his life. He dictated a “sugar-coated” version of his life to author Bob Considine and his “official” memoir, The Babe Ruth Story, was published (of course, omitting the countless hookers, numerous affairs, and various women he had plowed through during the previous 25 years). At an autograph-signing reception for the book, Ernest Hemingway stood in line to get the Babe’s signature and meet him. Ruth made his final appearance at Yankee stadium on June 26, 1948. His old “number 3” uniform hung limply on his body, a skeleton by now, ravaged by cancer. Ruth croaked out a hoarse, raspy speech of gratitude to the packed house and shuffled off. The crowd of 58,339 gave him a standing ovation. Ruth spent his last days in the hospital. During his time there, he received the relatively new treatment of chemotherapy and various other experimental treatments with some success (even at one point having his headaches go away and gaining about 20 pounds, before the cancer came back). Gifts and mail flooded in from all quarters. Toward the end, Ruth pinned a medal he received in the mail on his pajamas. When famed manager Connie Mack came in to visit him, Ruth told him, “The termites have got me, Mr. Mack.” One nebulous, but interesting, hospital visitor was a “tall, striking redhead” named “Loretta”. She claimed she had been Ruth’s girlfriend for the previous 10 years. Knowing the Babe, she was probably telling the truth. On August 16, 1948, at the age of 53, The Great Bambino finally passed away.